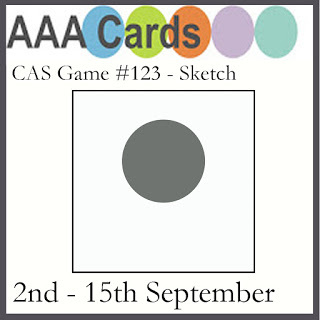 Another 11th hour entry to the One Layer Card challenge over at Less is More! I know a lot of people don't look forward to the OLC challenges, but I'm finding that I'm enjoying the simplicity. 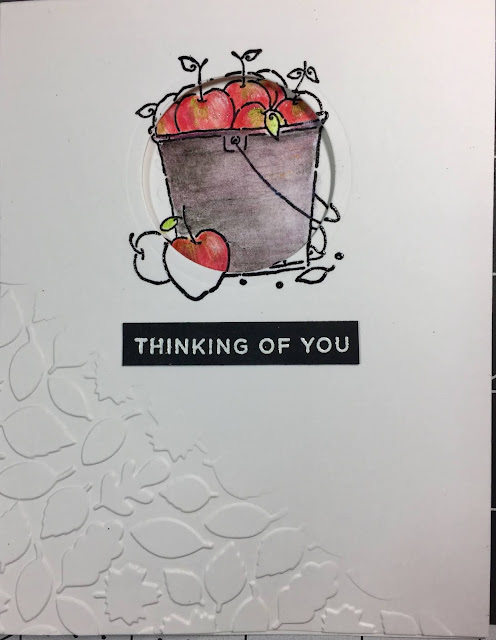 For this card I started with a simple flower from Simon Says Stamp's Beautiful Flowers set, stamped with Gina K's black amalgam ink that's alcohol ink-friendly. 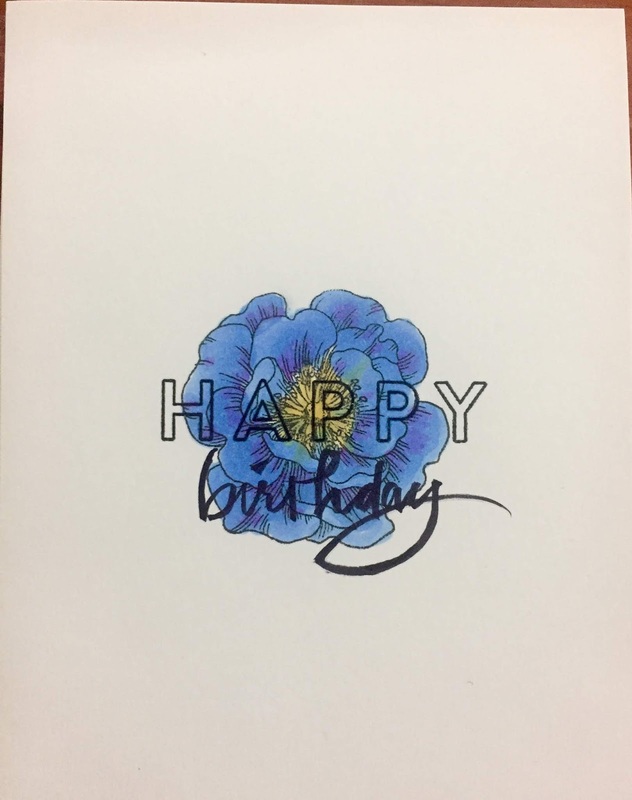 I then colored the flower with alcohol pens, and stamped the "Happy" sentiment (also from the Beautiful Flowers set). I wrote the birthday sentiment using my Kuritake brush pen. 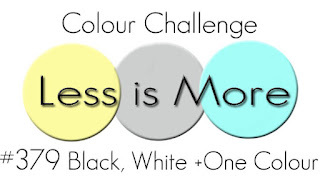 A last-minute entry to the Less is More OLC challenge, Focus on the Sentiment. I began with a balloon stencil I made with my Cricut back when I was taking an online card class. 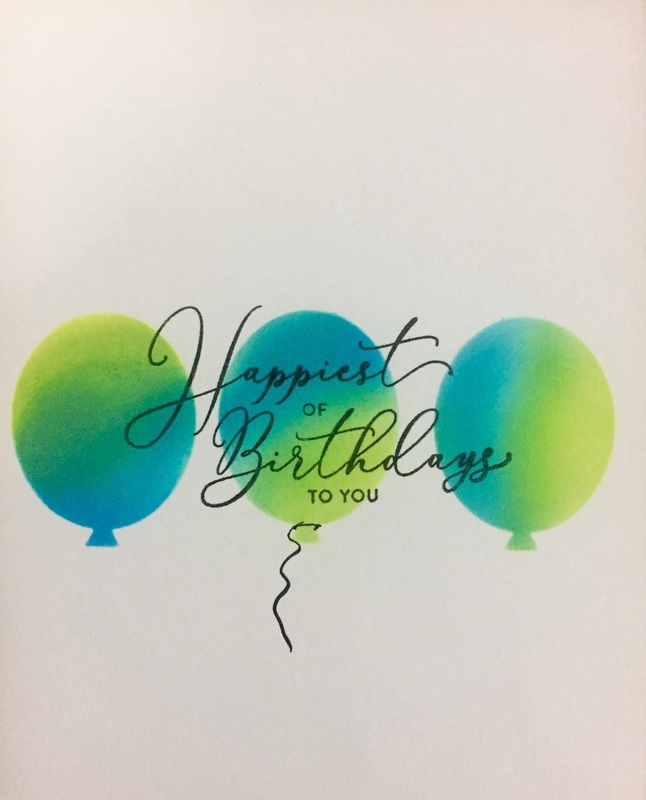 With Distress Oxides I colored the balloons in Mermaid Lagoon and Squeezed Lemonade, creating a fun green shade when the two blended. When the inks were dry, I simply stamped the sentiment, from Simon Says Stamp's Sketched Flowers set, in Gina K's black amalgam ink and heat embossed with Ranger clear embossing powder. I free-handed a little string to one balloon and that's it! Another grid pattern card, this one using Altenew's Grid Stencil with Distress Oxide inks in Mermaid Lagoon, Peeled Paint, and Squeezed Lemonade. 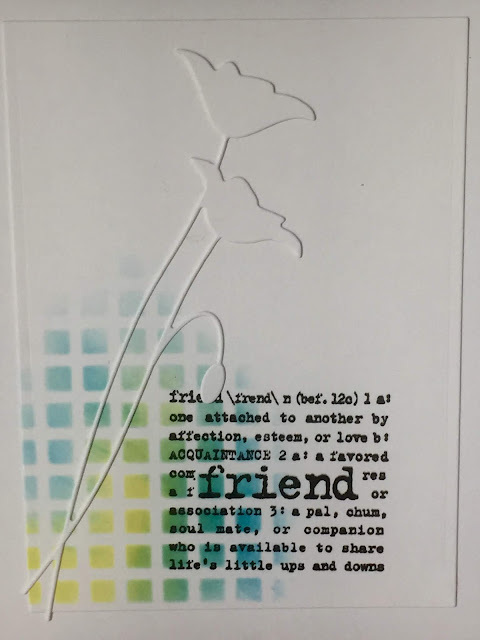 I stamped over the grid with an old favorite from Stampin' Up! and added a die cut Prim Poppy from Memory Box. 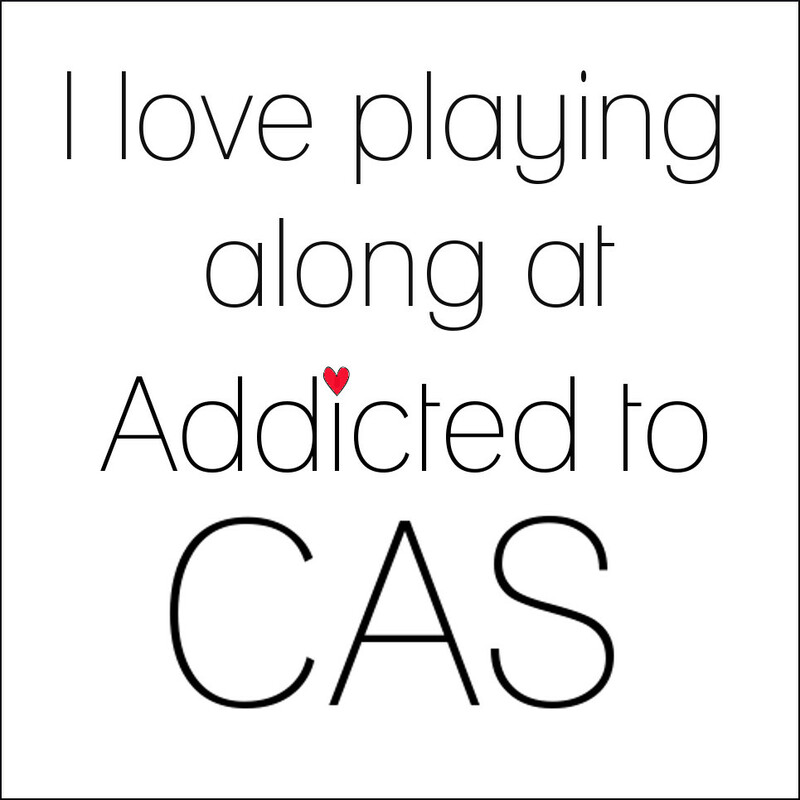 Playing along today with Code Word "GRID" over at Addicted to CAS. I kept this simple, using a grid I'd made with my Cricut as a stencil with Distress Oxides in Worn Lipstick. The sentiment is from Honey Bee, stamped with Versafine Onyx and heat embossed with Ranger clear embossing powder. 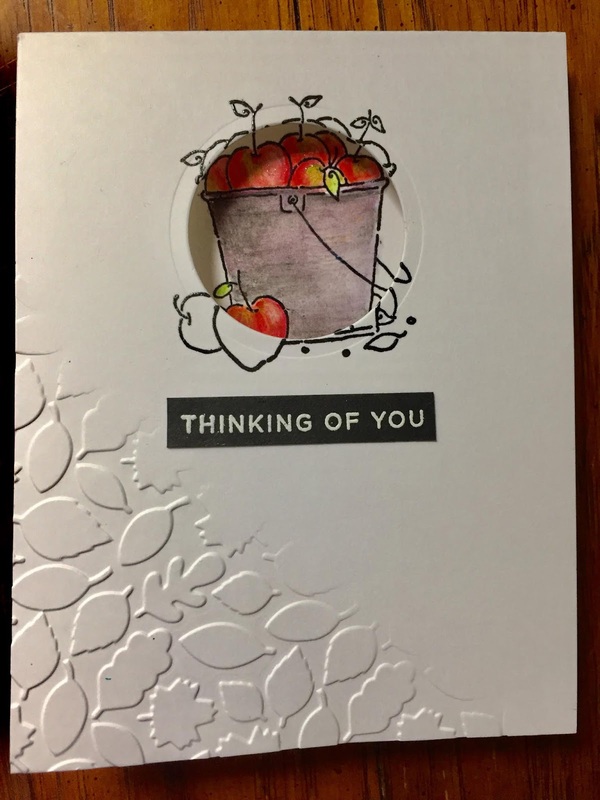 I die cut the layer with Lawn Fawn's Large Cross-Stitched Rectangle dies and adhered it to a card of 110-lb. Neenah solar white card stock. 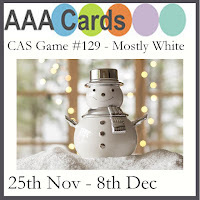 After a little break from cardmaking while I celebrated the holidays with family and friends, I'm excited to be entering CAS challenges again! Today I'm playing along Less Is More in a unique sketch challenge. For this card I used a mermaid-fin stencil I created with my Cricut Explore Air. The colors are Distress Oxides in Wilted Violet, Seedless Preserves, and Mermaid Lagoon. 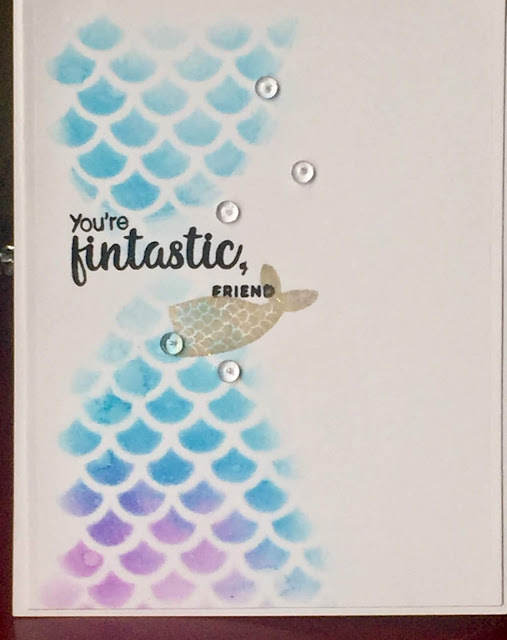 I stamped the sentiment in Versafine Onyx using Sunny Studios' Magical Mermaids stamp set. The mermaid tail is from Flora and Fauna's cute Mermaid Animals set. I stamped the tail with Versamark then heat embossed it with Ranger's Enchanted Gold. I added the bubbles for a little bit of bling. Just for fun I made another card for this challenge! It was such a creative sketch my head filled with ideas. Butterflies seemed to fit. 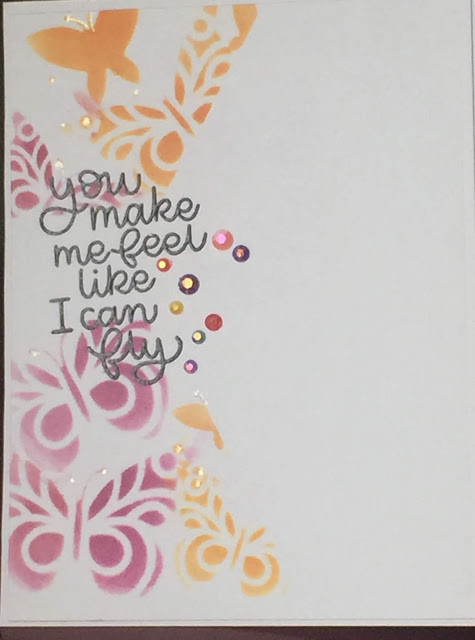 I made this design using Simon Says Stamp's Beautiful Day set that was in a kit last summer. For the background I used the butterfly stencil from the kit and Distress Oxides in Seedless Preserves and Fossilised Amber. 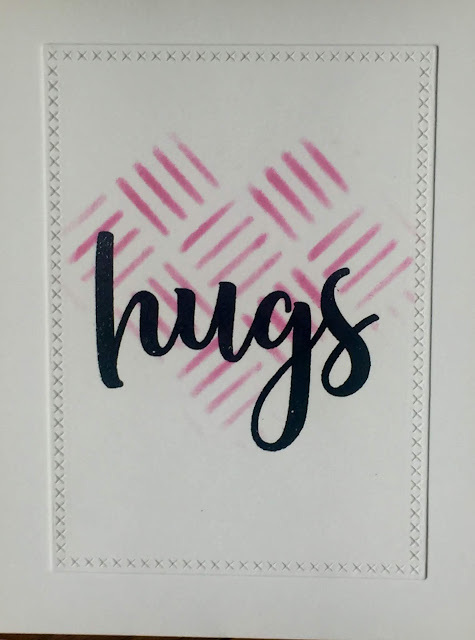 I stamped the sentiment in Versafine Onyx and heat embossed with Ranger clear embossing powder. After adding a few sparkly gems and a little bit of glitter pen here and there, I was done! Both of the designs were masked first using extra-wide purple tape. Break time is over! After a couple of months when my creativity hijacked by a kitchen remodel that took way longer than I expected, I'm back at my craft table and making Christmas cards! 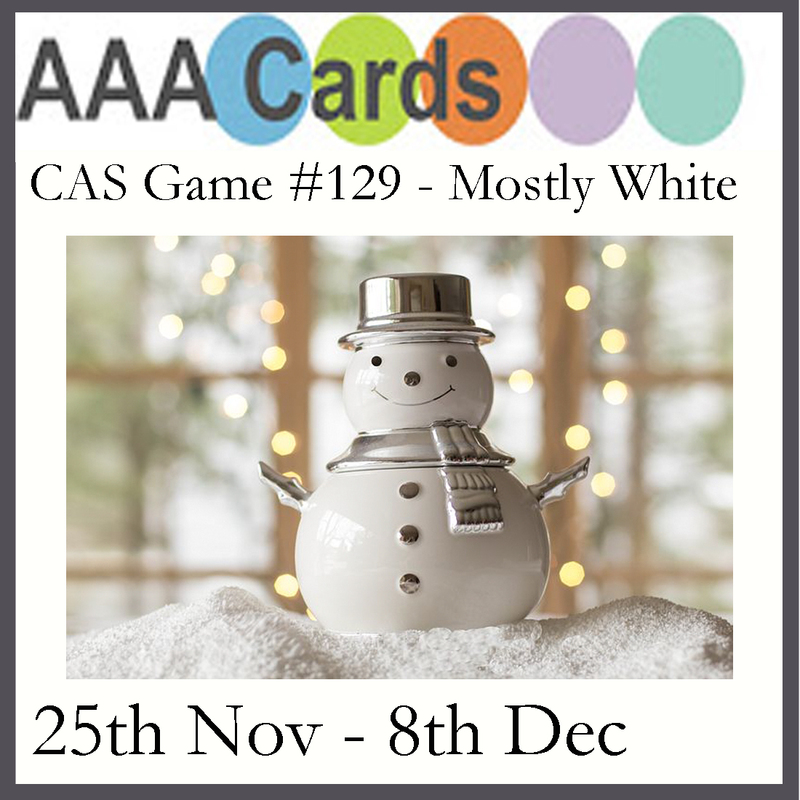 This week I'm playing along with AAA Cards CAS Game "Mostly White," a design theme I really love. Had fun trying out some new Christmas dies. 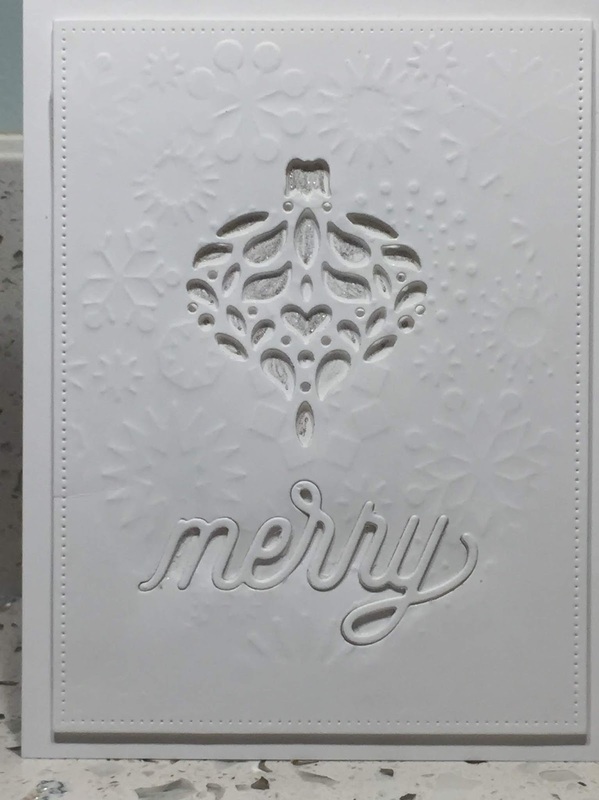 For this one I used two Simon Says Stamp designs, Merry Dies from CZ Designs and Corbel Ornament Collage. 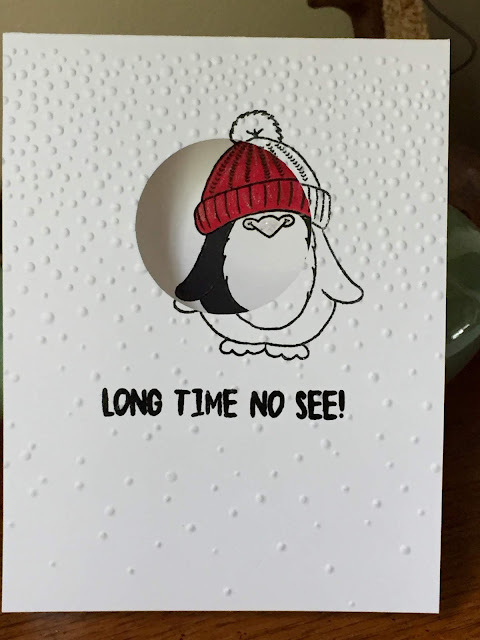 I made the background using a partial emboss technique with one of my older Cuttlebug embossing folders after running the dies through. 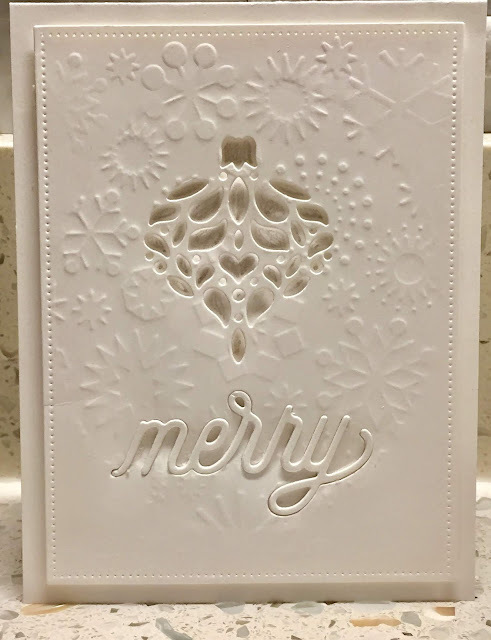 I popped up the embossed section with double-stick foam tape, then filled in the ornament die cuts using a Gelly Roll glitter pen. I stacked four die cuts of the word Merry and glued them together, then mounted them inside the die cut space letterpress-style. The picture below shows the glitter on the ornament a little better. 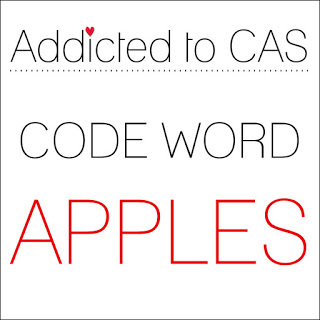 Still playing with apples and the AAA Cards sketch! I wanted to try a different take, this time using a diecut technique. With my MISTI, I stamped the image twice using Versafine onyx ink, once on the front and then on the inside. The great thing about the MISTI is that I know the image will be in the same spot on both sides of the card. That is, as long as the inked-up stamp stays in place when the MISTI is closed. This particular stamp was once a rubber stamp, which I had removed from its wood block, delaminated, and treated with a tacky glue so it could be used like a clear stamp. Unfortunately, the tacky glue wasn't as tacky as it once had been. 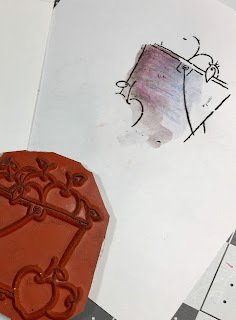 After several attempts to stamp during which the stamp fell off and made a near-perfect impression on a spot where I didn't want it, I figured out that I could carefully close the MISTI back-to-front, very slowly, and hit the right spot. I used one of the mistakes to practice my watercoloring. 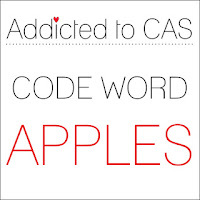 It actually turned out kind of artsy looking, in spite of my ineptness, don't you think? 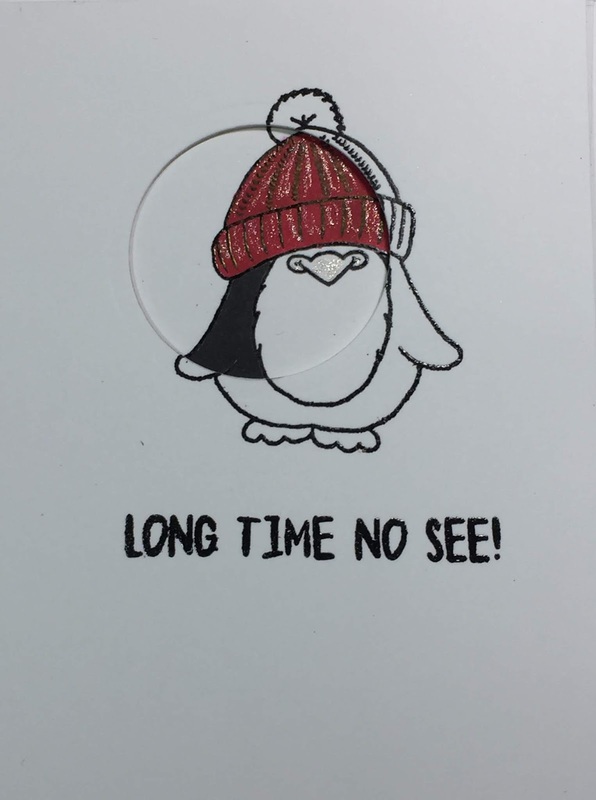 Next, I diecut a small circle in the top card, then colored only the inside image with colored pencils. The result is that you see the image with color in the center fading to black and white on the outside. The images do line up; it's difficult to tell by the photo without the card being completely flattened. Before adding the sentiment, I did a partial emboss on the front using an embossing folder with my Big Kick, to give it texture. I made a second card using the same technique with black, white and one other color for the current Less Is More challenge. I've been anxious to try out this cute stamp from Gerta Steiner that I've had all summer. 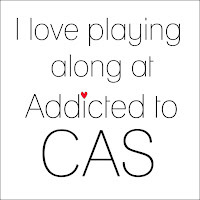 This seemed the perfect challenge! Once again, I stamped both front and inside with Versafine then heat embossed with clear powder. This time I colored the image with alcohol markers. For texture, I ran the front cover through my Big Shot with an embossing folder from Stampin' Up, Softly Falling. 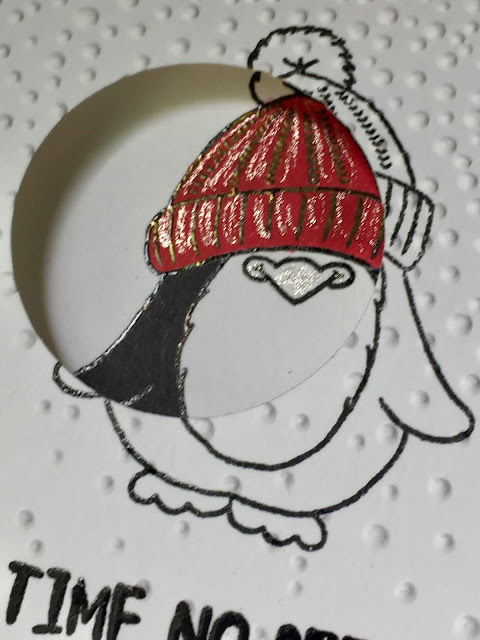 For a little bling, I added a bit of glitter pen to his hat and nose.